In 2018 INOMICS released another of its Salary Reports which provides an overview of a survey conducted of 2175 people in 2017 and contains insights into the job market. Respondents came from 117 countries, 17 more than the year previously, and the figure of those asked represented an increase of 11% on the previous year. The report takes into accounts of gender, level of academic degree, sector, number of years of experience and seniority. The focus of earlier reports was on the academic job market with the majority of respondents representing universities, research institutes or think tanks and possessing high academic qualifications; however, for the 2018 report, we have taken into account those working in the private sector in order to give a more well-rounded view. Bear in mind when looking at these figures that the average cost of living in these countries has not been taken into account. Want to read the full Salary Report 2018? Head over to our Salary Report page to download it. The highest average salaries for almost all positions in both academia and the private sector were in the USA, Switzerland, and Canada. Other countries ranked relatively highly, but pale in comparison to the top three. For example, the average salary in the academic sector for the US $144,040, compared to the United Kingdom at $84,950 and Germany at $69,010. In the private sector, the USA had an average salary of $139,340, the United Kingdom at $89,250, and France in third place this time at £80,730. Drilling down, juniors in academia received $95,940 on average in the United States, whereas in United Kingdom they were afforded just $50,180 and in Germany only $43,450 - a stark disparity. Other interesting findings show that in the US and Germany, salaries are 10% higher on average than in private sector salaries, an anomaly across the rest of our results. Of course, those employed in research in the private sector overall earn on average 30% more than those working in academia. Australia and Oceania were, however, exceptions to this trend. Unfortunately, we noted a significant gender pay gap across the world, especially at senior-level positions, in both the private and the academic sectors. Men's salaries are on average 18% higher in academia than women's salaries, and we observed a 'salary ceiling' - along with a glass ceiling - which made it not only difficult for women to rise to the top, but even once they have, difficult to earn the same as their male counterparts. 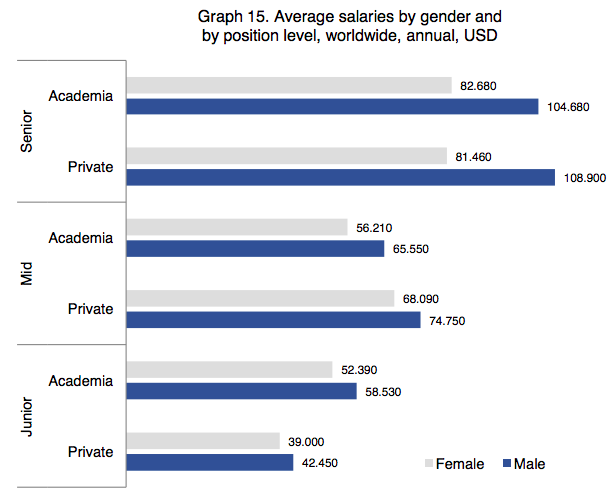 Men receive 27% and 34% higher salaries for senior positions in academia and the private sector respectively. Regardless of all of these negative points, however, compared to 2016, less gender pay disparity was observed worldwide for several of the positions we looked at, including PhD candidates and full professors. Things are moving in the right direction, but not fast enough. In two continents we noted higher average salaries for women, those being in Asia at mid- and junior-level positions, and in Australia & Oceania at the junior level. In some specific Western European countries, such as in the UK and Spain, women earn more than men on average as professors. 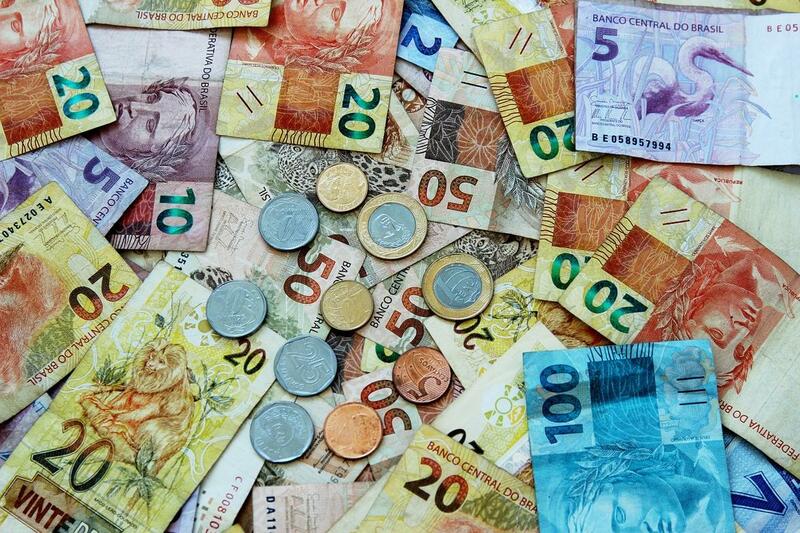 Worldwide, men receive $83,570 on average, and women $62,640. For PhD candidates, the highest salaries are in are in Switzerland and Canada, with PhD candidates in Switzerland earning on average twice as much as those in Germany. Again, these figures are net salaries, not net income, and don't take into account living costs, which may explain some of the disparities, if not all. Overall, in the USA and Germany, salaries for PhD candidates have increased over the last five years, but across all of the countries we surveyed, this wasn't the case in the world; generally, there has been some fluctuation between 2012 and 2017, but no obvious observable trends. As to be expected, more experience resulted in higher pay. The average salary for someone with less than one year of experience in the academic sector was just $28,990; jump to over fifteen years of experience, and this number increase to $91,700, and even higher in the private sector at $109,000. 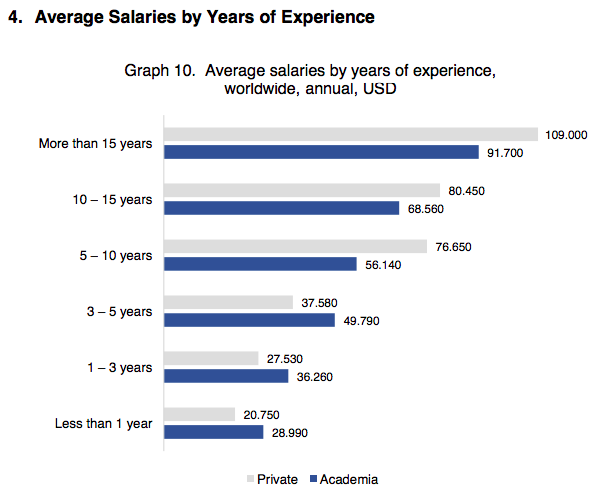 Interestingly, typically salaries for the first five years of experience are higher in academia compared to the private sector. However, this changes one one hits the 5-10 years' of experience mark, in which the private sector rapidly overtakes academia. To see our Salary Report in all its detail and glory, head over to our Salary Report page and get downloading!